In trying to predict the next Shark Tank contestants success before the coming show, we spend some time learning about the contestants first before they air on the Shark Tank Show. 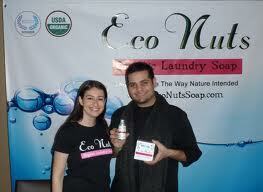 There seems to be a lot of eco-friendly companies popping up lately which is a good thing, but Eco Nuts Soap was different. An actual soap nut that I was not aware even existed. A nut that easily produces a natural soap plus a couple of ambitious entrepreneurs that have turned them into a successful business. Mona Weiss and Scott Shields was the last contestants of episode #406 to enter the Shark Tank. Two deals had already been completed earlier with the Sharks that statistically put Mona and Scott at a major disadvantage if you keep track of those types of facts. explaining all the benefits of their organic products. Mona puts in just 1 soap nut into a jar of water and within seconds of shaking it turns into soap water. She then explains you can use them up to 10 times before replacing the eco-nuts. It was an excellent demonstration how fast and easy they produce a natural soap. The presentation was going good until Scott answered a question from Daymond John that I'm willing to bet he'd like to take back. Scott stated the "Soap Berry Market" is approx. a million dollar market in the U.S. and Eco Nuts controls 90% of that market. Mona instantly realizes the mistake and tries explaining what Scott's talking about. The Sharks do the simple math which means Eco Nuts has at least $900k in sales, right? We'll not exactly. Last years sales were $100k and this year they're on track to do $250k in sales. (pre Shark Tank Effect) Impressive sales growth but I honestly think Shields thought he was being asked a different question. But the damage was already done. To the Sharks as with any Angel Investor, the numbers are what they care about most The numbers just didn't add up and turned off most of Sharks right away. Mona quickly (and wisely) gets the subject changed back to the Eco-Nuts product and hands out a sample to all the Sharks. She then points out they have a proprietary patent to clean and sterilize the nuts thereby separating themselves from any past of future competitor. Mark Cuban cant help but say "stuff on nut's, imagine that" "Everybody needs their nuts sterilized" LOL- only Mark Cuban could say that on T.V. So how does Mona Weiss and Scott Shields justify over a million dollars for their start up company? They have doubled and tripled sales every year in business as they continue growing a loyal customer base. The first year they made $10k and put it all back into the Eco Nuts Brand. The next year they did $40k, then $100k. This year they are projected to hit $250k which easily you can get to a million dollar valuation. Barbara asks how do you get your customers? Weiss says she is a "Social Media Ninja" She then tells Corcoran that "we have more fans on Facebook then you do Barbara". Oops- Barbara says she is insulted and she is out without batting an eye. Mona says "Oh don't be out yet". The look on Mona's face was priceless. I was expecting Barbara to invest in Eco Nuts and made mine shrivel right up when she said that. But Barbara is a nice Shark and was only kidding. But that was only a warm up for what was coming. Robert seems to be the only Shark in the Shark Tank willing to let the numbers slide and make them an offer for 50% of the company. Mona responds "you'd better be working 16 hours a day In our Business like we do". Robert is shocked and says "excuse me"? Had Mona only known what happened earlier with the Cousins Maine Lobster deal she might not of seemingly offended Robert that he might actually have to "work". Probably not exactly the best thing to say to a Billionaire Shark that already has a full time job but it kind of said a lot about Robert in how he chose to handle it. It's Mark Cubans turn and he thinks the marketing is not very impressive. Mona tries to defend the Eco Nuts product but Mark sees nothing that is standing apart from other brands to make it unique as it is. He's Out. Now it's Barbara's turn and she is more interested in them getting married. She agrees that the message is not coming Thur in the packaging. She's out. Kevin O'Leary is the last Shark standing and acts like he is about ready to make an offer. Just not the kind of offer they were looking for. Mr Wonderful offers to marry them right there on the Shark Tank. I don't think Mona was ready to get married to Scott right then unless of course Mr. Wonderful would of made them an offer they couldn't refuse. He Didn't. No doubt the entire 'Soap Berry Market" and more importantly EcoNutsSoap got a big boost in consumer awareness tonight. This is a relatively untapped market that both Mona Weiss and Scott Shields are destined to become major players in. What is a Soap Nut? "Sapindus Emarginatu"
The EcoNutsSoap story got me wondering just exactly what is a soap nut and where do they come from. Interestingly there is up to 12 different species in the Lychee family that produce soap nuts. Even more interesting is the fact that they include both evergreen and deciduous species of shrubs and trees. 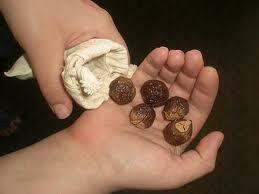 The Sapindous also known as soap berries or soapnuts is because of the fruit pulp that makes the natural soap. The generic name is derived from the Latin words saponis, meaning "soap", and indicus, meaning "of India. As the berries start to mature they become what is known as "Drupes" (the actual soap nut berries). Native Asians have been using these natural soap nuts for thousands of years and thanks to companies like Eco Nuts Soap, they are just starting to be used on a larger scale as a natural Eco friendly alternative. I think Mona and Scott got a bum rap. They have won a Nexty award from the Natural Products Expo and couldn't say it on TV. Before the episode aired, they also won the Best New Green Product from Expo East as voted on by the attendees. I have met them and they are nice and sincere and now people either love the product or are turned off from the Shark's being mean, but their product is great and they try to do right by the environment while helping people be green with a great product that they care about. The shell contains a high level of saponins which is an excellent hair tonic and is also known for its ability to cleanse and wash and used in cleansing lotion, protein shampoo, and protein shampoo with conditioner. We also offer packaging per your requirements. We also offer custom packaging with your own artwork, logo, text, a product completely ready for your customer. If you need soap Nuts from Nepal, we are there for a steady and long term supply . Some portions of the sales help support an orphanage and a single mom income generation program in the region. The Photo above is not of Mona and Scott, it's of Mona and Michael Costello from Project Runway. Also, I've met Mona and Scott before at an awards show where they were up for for a sustainable business award, and they're an awesome couple and do a great job running their company. I think the show didn't really represent who they are and what a great job they are doing for the environment. I was sorry to see this didn't get an offer. I am not usually into the whole ECO thing, but this definitely got my attention and I am going to purchase it for my home use, if this company comes up with an Eco Nut detergent for automatic dishwashers I will be even happier! One good thing, even when a product doesn't get an offer on Shark Tank, it gets huge exposure and already in one week I have searched for two products to purchase , this and the chord Buddy (which did get a deal as I recall). I LOVE this show! Mona was not exactly overflowing in tact. Never smart to insult TWO sharks while you're trying to convince them to significantly invest in your product. And for that reason, I'm out (in becoming a customer of echonuts). Happy they got the exposure. The sharks were way too hard on them. I usually respect the sharks opinions but this product looks good and I think the packaging is great. Don't really understand why the Sharks were so mean to these two. Sure there was a little lack of tact on the part of the presenters and some mistakes here and there but overall it was not bad. There are two products I have been interested in actually purchasing since I started watching Shark Tank and this is one of them. That's starting from Season 1 to this show. I haven't seen any of the other shows yet. They did a good enough job presenting to cause me to want to purchase (insults or not). The quality and price of the product is what matters. I'm going to give it a try. This exact same product was on Dragon's Den in canada, W. Brett Wilson invested. I wonder if Kevin remembered it. I didn't know they had investors in Canada, what with half of everyones income going to taxes to pay for "free" health care.